"All imitated Bolintineanu .... Eminescu broke the shackles almost all on a sudden with Venus and Madonna". Such was Nicolae Iorga's observation in 1895 . The story of the publication of Venus and Madonna in Convorbiri literare and with that the discovery of Eminescu is too well-known to be repeated. It may only be mentioned that a few weeks after the publication of the poem Iacob Negruzzi wrote to A.D. Xenopol that it was heightened beyond measure in the Junimea circle, though none of them knew its author . After the first flaah of surprise was over and Eminescu's literary genius was recognized, this sensation-making poem posed certain problems to critics and annotators. Two years after its publication, Titu Maiorescu saw a confusion of images in the "queer" Venus and Madonna, though he appreciated its grand conception the charm of its diction and Eminescu's understanding of ancient art . Much later, C. Papacostea likened Eminescu's love for antiquity to that of Schiller's . In 1932 G. Bogdan-Duică quoted a passage from Jean Paul's Vorschule der Aesthetik similar to the idea of Venus of Madonna, where it was held that Venus could be beautiful only, but Madonna was romantic and that the source of romantic love was to be sought for in the Christian temples, rather than in old German forests; this superior form of love, where a beautiful body melts into a beautiful soul, was a flower of Christianity . In his critical edition of Eminescu's poems D. Murăraşu corroborated the view of Titu Maiorescu. He felt that the woman, whom the poet fire adored, then disregarded and finally treated with softness and warmth, was neither Venus, nor Madonna, but a third category of woman quite different from the two. In his opinion, the title of the poem was incomplete, as is did not encompass the entire context . The significance of the two images and the source of their inspira&not;tion thus remained obscure. It seems, however, a little strange that though it was realised that Venus and Madonna was quite off the beaten track, and though the poet himself left a suggestion that his "lost ideal" belonged to "the night of a world which was no more, that this'young and sweet message" came from a "sky with other stars, other heaven and other gods", the critics did not think of looking for its sources in a soil other than the European. In the opening lines of the poem, Eminescu refers to a world, which thought in fairy-tales and spoke in poetry. Naturally this world, if ever existed, existed long before the Christian era. It is possible that Eminescu wrote these lines under the influence of Herder's hypothesis that poetry was the first diction of the childhood of humanity. Since the Indian Vedic poems were taken as a strong argument in favour of Herder's theory  this fact may give us a clue to the sources of Venus and Madonna. However, before we look for some correspondence of Eminescu's poem in old Indian literature, let us consult biographical documents, about the background of its writing. Venus and Madonna was written at least one year before its publication (1870)  at the same time as writing Geniu pustiu . Themes of these two works are also alike. The varying attitudes of the hero towards the heroine in the novel are similar to those of the poet in Venus and Madonna. The woman in the poem is a bachhante and the heroine of the novel is an actress. At the time of writing Geniu pustiu, Eminescu was in love with an actress of a provincial stage, about whom Caragiale speaks in his article In Nirvana. Caragiale remembers that one evening Eminescu showed him a poem composed by him about an Assyrian king, who was tormented by his own passions. The following day, the budding poet looked quite depressed and irritated. For, in the meantime, he had shown the poem to his actress lover, who was little impressed with the fate of the Assyrian king (perhaps Eminescu referred to this in The Blue Flower). On the third day, he regained his spirit, and among other things told Caragiale about ancient India and about the Dacians. Shortly after Eminescu went to Vienna, wherefrom he sent Venus and Madonna . Caragiale's memoir reveals two singnificant points of Eminescu's thoughts. Firstly, thinking of ancient India he recovered from the shock of disillusionment. Secondly, even in his adolescence India occupied the same place in his mind as did the ancestors of the present Romanian people. For our purpose, the first is more important. Caragiale's article does not offer any further details. So, it is not possible to know what particular aspects of India consoled Eminescu at that moment and brought him back to bis spirit. Nor is it possible to form an idea of the poet's knowledge of India at that period - It is gener&not;ally believed that Eminescu's acquaintance with India dates from the days of his studentship in Vienna. But Caragiale's article shows that even before going there, he knew much about India as to speak for a lenght of time. Ştefanelli says that Eminescu knew a lot about India in Cernăuţi , and that in Vienna he read a number of Indian texts translated into German including Sakuntala . So, it is confirmed that at least as late as in Vienna, Eminescu came to read Kalidasa's Sakuntala. Here, we may reflect upon one point. Eminescu was a voracious reader. Both in idea and knowledge he was far ahead of his contemporaries. As we are to reconstruct his knowledge, at least about India, from the memoirs of his friends and colleagues, mostly written after his death, we have to think of the possibility that his friends did not know all the books he read. Even if they heard about them from the poet, they might have forgotten a number of names at the time of writing and confused the years. None of these remembrances was meant to be a proper biography, and the correctness of date cannot be expected. Forster's German translation of Sakuntala was published in 1791 . At that time it created a sensation among the German romantics; both Goethe and Herder spoke about it in highly appreciative terms. 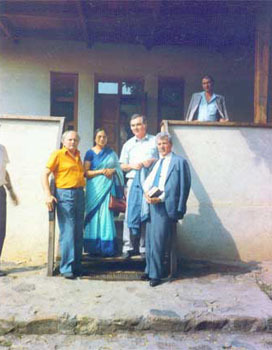 Eminescu studied at Cernăuţi and even at that tender age was the custodian of Aron Pumnul's library . As in those days, Cernăuţi had a close cultural contact with Vienna, it is not improbable that Eminescu read Sakuntala there itself. Later on, he read Max Muller's A History of Ancient Sanskrit Literature , which quotes Goethe's famous quatraine on Sakuntala on its very first page. In view of the above, we may assume that at the time of writing Venus and Madonna and Geniu pustiu Eminescu knew about Sakuntala and about the impact it created on the German poets. (Eminescu's inter&not;est in German literature, even from his boyhood days has been recorded by many, and may not be repeated here). Perhaps it will not be too much to suppose that he was influenced by Sakuntala to some extent. If we place Kalidasa's Sakuntala side by side with Eminescu's Venus and Madonna and its prose analogue Geniu pustiu, it will be revealed that the latter two are built around a theme similar to that of the first. In Sakuntala, the hero, Duşmanta, falls in love with Sakuntala in her forest home, marries her, then, going back to the capital, forgets her under a magic spell cast by the curses of an angry ascet. When Sakuntala, comes to his court, he insults her in public. Finally, he regains his remembrance, is down wich remorse, and asks for her forgiveness when he meets her again. The varying attitude of the hero corresponds to those of Emi&not;nescu's characters. We shall limit ourselves to Venus and Jfadonna, and go into the details of its text and structure. Structurally, Venus and Madonna is like a dramatic monologue. It has the characteristics of a drama in four acts. In the first part, Eminescu establishes the character of Venus, in the second part, that of Madonna; in the third part, the person symbolizing the both is condemned. Then follows a gap, indicated by a line of demarcation between the 10th and the 11th stanzas, like fall of a curtain in a drama, and the fourth part, the last two stanzas, show repentance and reconciliation. So many contradictory ideas can hardly be accomodated within the frame of a lyric poem. So far as poetical qualities are concerned, the last part weakens the poem. By accepted European standards, it is also an weakness for a drama to end in such an anti-climax. But, according to the classical Indian conception of style, which did not allow a drama to end in tragic separa&not;tion, this reconciliation was essential. It is worth-while to mention that these two stanzas do not appear in he first draft in ms. 2255  ; they are a later addition in ms. 2259 . Perhaps they were added after a better ac&not;quaintance and deeper study of Indian literature, as Goethe added the Theatre prologue to Faust, after the model of the Prelude to Sakuntala in 1797, long after writing the original play . In the text of Venus and Madonna, we find some motives common with Indian poems. The beauty of the heroine is expressed by the descrip&not;tion of her eyes, hair, and arms, as is done in Sanskrit poems. Eminescu's heroine is blonde like an European beauty, but strangely enough her eyes are dark and as deep as the sea like the eyes of an Indian beauty. The arms of Venus are compared with the thoughts of an emperor-poet. Murăraşu wonders whether he referred to Byron's hero Sardanapalus, but at the same time he feels that Eminescu's emperor has more depth of understanding of human character; he has got a poetical conception of life for himself, as well as for his subjects . Perhaps this emperor was Kalidasa's hero Duşmanta, who thought and spoke in poetry. In Eminescu's poem the hero condemns the heroine as a woman with a barren heart, who has stolen the sacred laurels of a martyr. In Kalidasa's drama Duşmanta accuses Sakuntala as a fraud who claims to be his legal wife; she poses to be an innocent girl brought up in an hermi&not;tage, but has all the shrewdness of a woman of low order. Sakuntala then lifts the veil off her face to arouse his memory; still he fails to recognize her, and abuses her more bitterly. In Eminescu's poem the hero realizes that it was he who threw a white veil of poetry on the face of this woman, and now as the veil falls off he finds his love cold and extinguished. He is now free from the "dizziness of dry dreams" (,,dismeţit din visuri sece"). In ms. 2255, 125 v we find another expression in its place &#8212; "shaken violently by cold life" (zguduit de viaţa rece)  &#8212; which was more appro&not;priate to the conditions of Duşmanta forgot his love in the forest hermi&not;tage after his return to the realities of palace life. Sakuntala's veil seems to appear in Eminescu's poem as a symbol of illusion. The last two stanzas of Venus and Madonna offer a striking resem&not;blance to Duşmanta's repentance in the 6th and 7th acts of Sakuntala. For the sake of comparison we are quoting below the relevant passagews from Sir William Jone's English translation of Sakuntala. Was it sleep that impaired my memory? Was it delusion? Dushmanta. O, my only beloved, banish from thy mind my cruel desertion of thee. - A violent phrensy overpowe red my soul. In Kalidasa's drama Sakuntala speaks very little to refute the charges of Duşmanta. She only weeps. In the last act, her tears are those of joy; yet, they move Duşmanta, and he falls at her feet. In Eminescu's poem the accursed woman does not speak at all, we feel her tears through the remorse of the hero, who falls at her feet and implores her forgiveness. In the foregoing pages we have dealt with the text and the structure of Venus and Madonna. We shall now look for some similarities in the essential ideas of the two texts, and shall try to arrive at an interpretation of the two images in this poem. Goethe's poem of Sakuntala presents the message of the drama in the short span of four verses. In the opinion of Rabindranath Tagore, this is a correct appraisal of Kalidasa's drama by a true connoisseur of literature. We shall quote below that famous quatraine of Goethe in Max Müller's translation. All is said of I name only, Sacontala, thee . Here the blossoms of spring is a metaphor of youth and fruits of late season is that of motherhood ; the earth is a symbol of passions and the heaven a symbol of maturity . Kalidasa's heroine combines the two in one. In Venus and Madonna, Venus is eternal youth ; Madonna is eternal motherhood. Eminescu's heroine is an embodiment of both. For, it is in the one and same woman Eminescu in whom saw Venus and Raphael saw Madonna. Tagore says, Sakuntala is Paradise Lost and Paradise Regained taken together. Similarly, Venus and Madonna is a poem of the loss and regain of the Paradise of love. When the passions have calmed down, the veil of illusion has fallen off, it is love that survives. It is love that makes a Saint out of a demon, a Madonna out of a bacchante. Kalidasa's heroine was essentially an innocent soul, an adorable character; Duşmanta blamed her through misunderstanding. Eminescu's heroine is in reality a fallen woman. The curses of the hero are cruel, but by no means baseless. Yet, the loving eyes of a poet raises her to the rank of a Saint. Eminescu's love is more glorious ; Eminescu's attitude is more human. From the point of view of artistic perfection, Eminescu's poem of adolescence does not stand in comparison with Kalidasa's materpiece. But, in the conception of love, the romantic poet has taken over his classical predecessor. 1. N. Iorga. Dimitrie Petrino &#8212; Poeme, Adevărul ilustrat, 8 mai, 1895, p. 6. 2. M. Eminescu, Opere, Ed. Perpessicius, 1939, vol. I, p. 287. 3. D. Murăraşu, M. Eminescu, Poezii, ed. critică, vol. I, 1973. 4. C. Papacostea, Filosofia antică în opera lui Eminescu, f.d., p. 31. 5. G. Bogdan-Duică, "Buletinul Mihail Eminescu", 1932, p. 200. 6. D. Murăraşu, ibid., p. 343. 7. Raymond Schwab, La Renaissance Orientale, Paris, 1960, p. 226. 8. Perpessicius, I, p. 286. 9. Perpessicius, I, p. 287. 10. I. L. Caragiale, In Nirvana, în Opere, ed, critică de Al. Rosetti, Şerban Cioculescu, Liviu Călin, vol. IV, 1965, pp.10-11. 11. Teodor V. Ştefanelli, Amintiri despre Eminescu, 1914, p. 26. 13. Raymond Schwab, ibid., p. 64. 14. G. Călinescu, Viaţa lui Mihai Eminescu, 1964, p. 79. 15. G. Călinescu, Opera lui Eminescu, vol. I, 1969, p. 447. 16. Perpessicius, vol. I, pp. 257-289. 17. Ibid., vol. I, p. 290. 18. Arthur A. Macdonell, A History of Sanskrit Literature, London, 1899, pp. 416-417. 19. D. Murăraşu, ibid., p. 344. 20. Perpessicius, vol. I, p. 288, vers nr. 29. 21. Sacontala of ihe Fatal Ring, Translated by Williams Jones, in The Works of Sir William Jones, vol. IX, London, 1807, pp. 492-493. 24. R. Thakur, ibid., passim.